The "Star" Ferry Company Limited is owned by The Wharf (Holdings), which has extensive commercial and residential property holdings in Hong Kong and Singapore and its iconic Star Ferry services are regarded as one of Hong Kong’s most famous heritage and cultural attractions, providing both a remarkably inexpensive method of crossing the harbour and the opportunity for some spectacular views of the harbour and Hong Kong Island and Kowloon waterfronts. 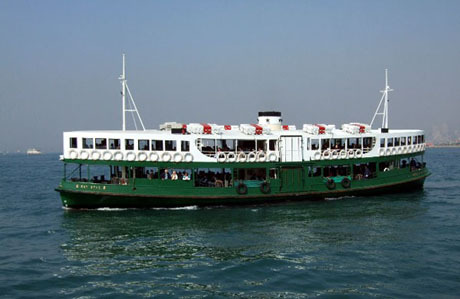 The service has operated since 1888 when Dorabjee Nowrojee, a Parsee, started a daily steam boat ferry, Morning Star, which operated between Peddar's Wharf in Pedder Street, Central and Tsim Sha Tsui. 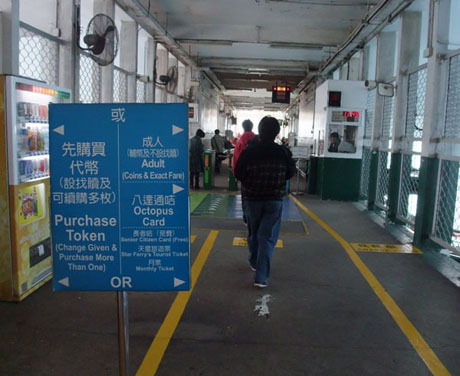 The service operated under the name Kowloon Ferry Company and carried employees of Hong Kong and Kowloon Wharf Godown Company across the harbour free of charge whilst in return, Kowloon Wharf provided the wharf and maintenance of the ferry. The name Star Ferry was adopted in December 1898 when the company was bought by businessman Paul Chater and a 40-minute sailing frequency was in operated with a fare of only five cents. During the Japanese occupation of Hong Kong the service was suspended for a period of 44 months from December 1941. In 1966, when the company applied for a fare increase from ten HK cents to fifteen HK cents, 27-year old So Sau-chung staged a hunger strike at the Central pier and was arrested leading to widespread protests and riots with about 430 people being arrested and services disrupted. Star Ferry backed down and restricted the fare rise to the first-class section only. The ferry remained the main method of crossing the harbour until the Cross Harbour Tunnel opened in 1972. The original fleet of boats utilised four single-deck coal-fired steam vessels and the current fleet comprises twelve double-deck diesel-electric air-conditioned vessels. The two newest boats "Golden Star" and "World Star" can each accommodate 750 passengers, 200 more than the rest of the fleet. In October 2014 Star Ferry announced proposals for a trial to retrofit one of its ferries with a modern diesel-powered generator driven electric motor propulsion system to replace the existing ancient diesel combustion engine. A separate water scrubber was also be fitted to the generator. The existing Star Ferry engines are unable to burn modern clean-burning fuels. The trial was supported by the Environmental Protection Department's pilot green transport fund and is expected to reduce fuel consumption and cut emissions. The ferry chosen for the trial previously operated on the Wan Chai - Hung Hom route which closed in 2011 and following tendering for the work and installation "World Star" entered service in November 2016 operating Star Ferry's new "Water Tour" to the Tsing Ma Bridge and Disneyland Resort Pier. Current services operate on two routes at intervals from 6 minutes. The average daily passenger patronage at mid-2016 is about 54,000 (approx. 39,000 for the Central - Tsim Sha Tsui route and 15,000 for the Wan Chai - Tsim Sha Tsui route. Overall average daily patronage for the whole year 2016 was 53,400. From 1999 until 2011 Star Ferry also operated two cross-harbour routes between Central and Hung Hom and Wan Chai and Hung Hom. Following heavy financial losses on these routes the company did not seek to renew the three-year licence to operate these routes when it expired on 31st March 2011 and no other ferry operator has expressed an interest in taking over the service. 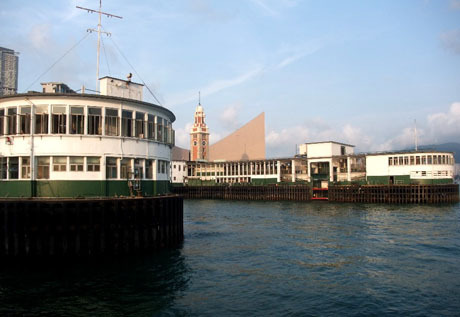 The new Star Ferry Piers in Central (Central Ferry Piers 7 and 8) opened in November 2006 after closure and subsequent demolition of the Edinburgh Place Star Ferry piers, some 300 metres distant, which had been built in 1957. Demolition was necessary to make way for the six-lane Central-Wanchai by-pass which is now under construction and due to be completed in 2018. The historic clock tower was dismantled with a government promise that it would be restored and displayed nearby and it remains to be seem whether this pledge is fulfilled. 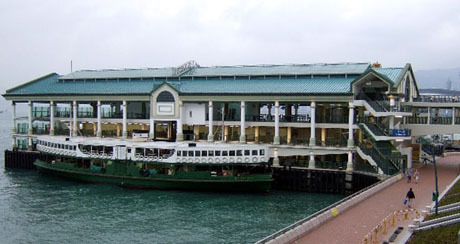 During June 2011 the Harbourfront Commission announced a redevelopment plan for Tsim Sha Tsui Star Ferry Pier which would involve adding an extra floor to the existing two-storey building and would increase retail space from 385 sq metres to 863 sq metres and provide an additional 1,472 sq metres of dining space. The plan includes a rooftop dining and viewing area with public access. The plan has been generally well received as it preserves the original architectural design but no timetable for commencement and completion of the work has yet been announced. The new piers are much more spacious than the old ones and have viewing decks and shops. Central Pier 7 has the prestigious Watermark Restaurant with harbour views. Central Pier 8, from where the Star Ferry Central - Hung Hom route had operated before its closure in 2011 is still partially occupied by Star Ferry Company but since February 2013 is also the new location for Hong Kong Maritime Museum which previously operated from leased premises at Murray House, Stanley until expiry of the lease in early 2012. Only the upper deck is available to passengers on the Wan Chai - Tsim Sha Tsui route. The new two-storey Wan Chai Ferry Pier opened on 30th August 2014. The old pier has been demolished as part of the Central - Wan Chai Bypass project due for completion in 2017. The relocation of the Wan Chai ferry pier, although by only about 50-metres eastwards and slightly north onto reclaimed land, after one year of opening has led to a drop in average daily passenger numbers on this route of about 20% from 19,400 to 14,900, possibly owing to the increased distance from the elevated walkway system link to the commercial district of Wan Chai. On the Central to Tsim Tsa Tsui route both upper and lower decks are available to passengers but on the other three less heavily used routes only the upper deck is usually used except at very busy times. Passengers on the Central to Tsim Sha Tsui route will find the journey on the upper deck more comfortable and spacious. However the lower deck allows more freedom to walk around the edge of the deck and is better for photography although diesel fumes on this deck from the engines can sometimes be unpleasant. Patronage has suffered following relocation of the Central Star Ferry Pier and the Star Ferry currently carries about 38,000 passengers a day on its Central - Tsim Sha Tsui route (down by about 25% since pier relocation) and 20,000 a day on the Wan Chai - Tsim Sha Tsui route. Future patronage is expected to be affected by two years of construction work from 2011 at the Star Ferry Bus Terminus site in Tsim Sha Tsui and redevelopment of Wan Chai Ferry Pier as part of the Central-Wan Chai Bypass infrastructure work. 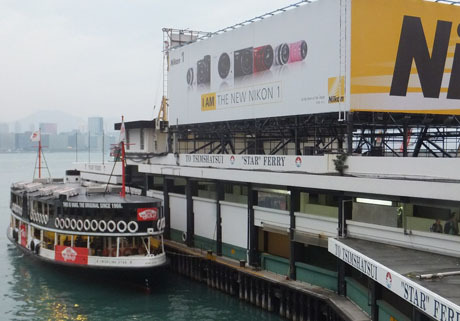 Star Ferry Company earns HK$3.3 million annually from two rooftop advertising billboards at Wan Chai Ferry Pier. 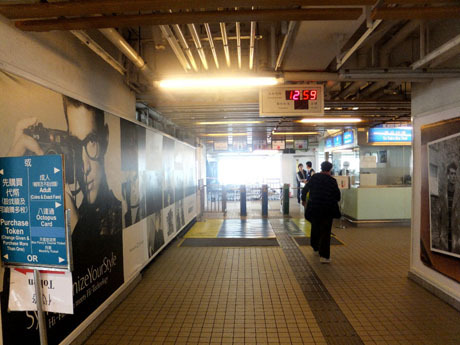 Since January 2011 additional revenue has been generated by external advertising on the Tsim Sha Tsui Star Ferry Pier which has given the pier an unfamiliar look. 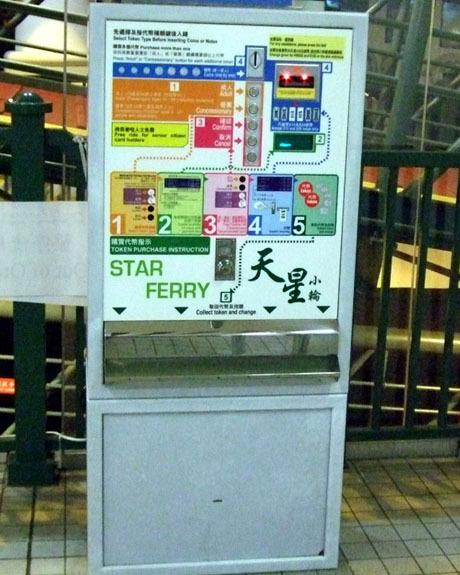 Star Ferry has utilised profits from its two Tsim Sha Tsui routes to subsidise its Hung Hom routes but in September 2010 the company confirmed that in view of falling patronage, competition fron rail operators and harbourfront redevelopment it did not intend seeking renewal of its three-year licence to operate its two Hung Hom routes when the licence expired on 31st March 2011. 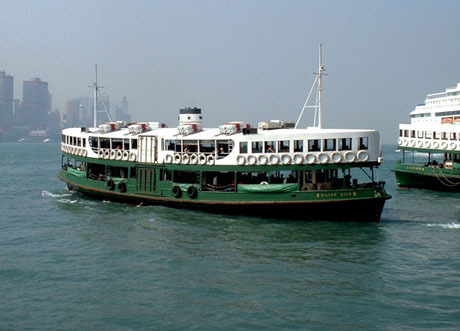 The two routes, which Star Ferry have operated since 1999, were put out to tender by the government for the service to be maintained but no other operator expressed an interest. 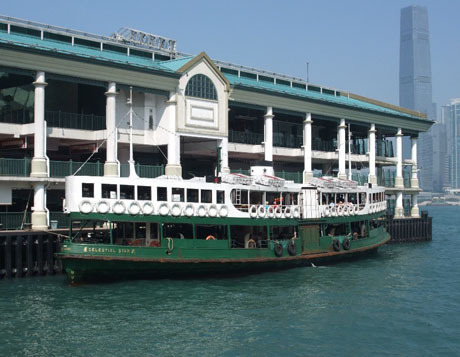 In December 2011 The Star Ferry Company's owner, Wharf Holdings, confirmed proposals to convert one of its retired vessels into a floating fine dining restaurant in an attempt to increase its revenues. The lower deck would be converted into a kitchen and the upper deck would be the dining area. The restaurant would initially be located at a harbour pier but may later be moved to the new Central waterfront, currently under construction. The floating restaurant was planned to open in early 2013 but had still not materialised by mid-2016. Fares remained unaltered from 1997 until 2009. 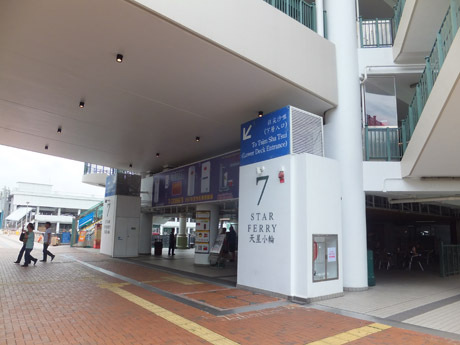 However, having been unable to absorb substantially increased costs and loss of revenue resulting from a 19% drop in passengers following relocation of the Star Ferry Pier in Central fare increases were approved and staged in two phases effective from 29 March 2009 and 1 January 2010. The increases applied to the Central to Tsim Sha Tsui and the Wan Chai to Tsim Sha Tsui routes and added 30 HK cents to the cost of weekday journeys and 80 HK cents to weekend and public holiday journeys. In the light of continuing heavy losses, projected future operating costs, revenue and increased costs and the Star Ferry's status as one of Hong Kong's most important heritage and cultural icons, in April 2012 the government approved a further fare rise for weekend and public holiday services. From 24th June 2012, fares on both routes on Saturdays, Sundays and public holidays adult fares increased by 40 cents and child and disabled persons fares by 30 cents. The cost of a 4-day tourist ticket was reduced from HK$34 to HK$25 as, since Hong Kong Tramways was sold by Star Ferry's owner, Wharf, to Veolia, it no longer includes tram journeys. 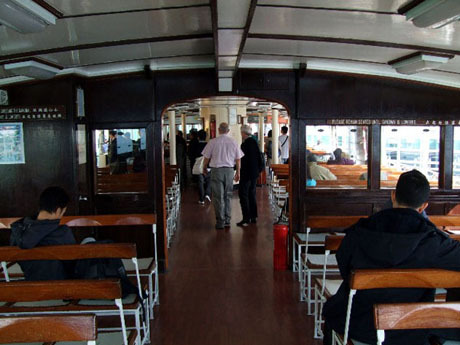 In addition, the government has agreed to reimburse Star Ferry for the total revenue foregone, estimated at HK$3.8 million per annum, for offering elderly concessions (free journeys for people age 65 and over) for the period from 24th June 2012 until the end of 2013. Bicycles are allowed only at off-peak times, and only on the lower deck of the Wan Chai to Tsim Sha Tsui route. From 24th June 2012 a bicycle fare of HK$13 (previously free) was introduced. In July 2016, following a continued decline in revenue mainly due to a drop in passenger numbers on the Tsim Sha Tsui - Wan Chai route following relocation of Wan Chai Ferry Pier, Star Ferry submitted an application for fare increases to be implemented in two phases. Under the proposals adult fares would have risen by between 40 cents and 60 cents in February 2017 and by a further 20 cents in early 2018 which would have resulted in a cumulative increase amounting to over 25% but the government found insufficient grounds to support that proposal. Instead an increase averaging 8.9% was approved to take effect from 15th July 2017. Star Ferry's current franchise expires at the end of March 2018 and following a review of its performance by the Government, a new 15-year franchise has been awarded which runs from 1st April 2018 to 31st March 2033. In consideration of the new franchise award Star Ferry agreed to provide a free wi-fi service in the passenger areas of its piers, develop an app for passenger information and strengthen staff training including English proficiency. The company will also retrofit two of its diesel vessels with diesel-electric propulsion systems in 2018 with remaining vessels to be retrofitted at a rate of one per year. Star Ferry will also take over management of Central Pier 7, Central Terminal Building, Wan Chai Ferry Pier and Tsim Sha Tsui Ferry Pier. Adult Monday - Friday HK$2.7 Upper Deck, HK$2.2 Lower Deck. Saturday, Sunday and public holidays HK$3.7 Upper Deck, HK$3.1 Lower Deck. Child age 3-12 Monday - Friday HK$1.6 Upper Deck, HK$1.5 Lower Deck, Saturday, Sunday and public holidays HK$2.2 Upper Deck, HK$2.1 Lower Deck. Bicycles are not allowed on this route. Ferries operate at intervals of between 8 and 20 minutes from 07-30 to 23-00 daily. METHOD OF FARE PAYMENT - by Octopus Card or token only (turnstiles which had accepted exact fare in coins were removed in May 2014). Token vending machines are located on the approach to the turnstiles at each pier. A special Tourist Ticket is currently available at a cost of HK$25* allowing four consecutive days unlimited travel on both the Central to Tsim Sha Tsui and Wan Chai to Tsim Sha Tsui routes. Star Ferry has introduced a round-trip “Water Tour” from Tsim Sha Tsui Star Ferry Pier to Disneyland Resort Pier. 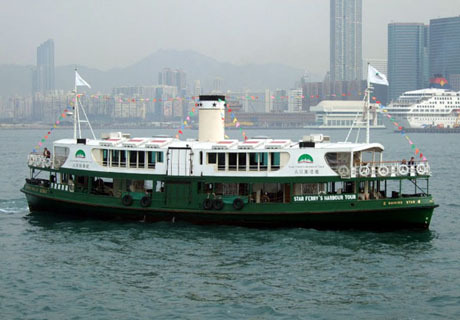 The new tour, which began operating on 15th December 2016, utilises a completely renovated Star Ferry withdrawn from service in 2011 when the Wan Chai – Hung Hom route closed. Co-funded by the Pilot Green Transport Fund of the Environmental Protection Department, “World Star” has been given a new life and become Hong Kong’s first diesel-electric powered eco-ferry bringing about substantial reduction in emission and higher propulsion efficiency. The renovated ferry features a spacious air-conditioned central cabin and café with luxury seating, tables and outside viewing decks. There are two daily sailings from Tsim Sha Tsui at 11-00 and 17-00 and from Disneyland Resort Pier at 11-45 and 17-45. Journey time on the outward journey from Tsim Sha Tsui is about 45 minutes and the return journey which allows passengers excellent views of the Tsing Ma Bridge, Stonecutter's Bridge and Container Port takes about 70 minutes. Promotional round-trip fare until 21st December 2016 is HK$160 for adults and HK$140 for child age 3-12, senior age 65 and over, persons with disabilities and persons making a group purchase for 10 persons or more. 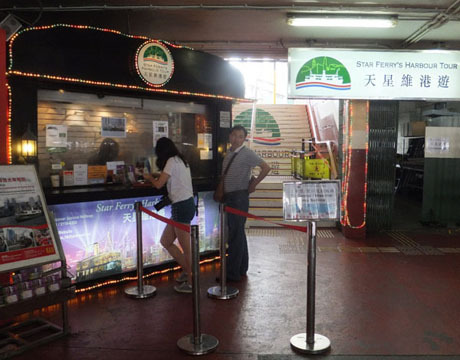 Tickets are sold on a “first come – first served” basis on the day of departure at the Star Ferry Harbour Tour Ticket Counter at Tsim Sha Tsui Star Ferry Pier Concourse. Payment by cash only in Hong Kong Dollars. No online booking facility is available. Ticket Counter is open from 10-30am to 8-45pm daily and tickets must be purchased at least 10 minutes before departure time. Ticket includes one snack and one drink. Passengers also have the option to purchase Round-trip plus One Day Disneyland Ticket or Round-trip plus Walt's Café Afternoon Tea/Lunch set packages. "World Star" also operates a nightly "ICC Light Show and Symphony of Lights Harbour Cruise", departing Tsim Sha Tsui at 19-25. Interior cabin of Star Ferry's "World Star"